Knight News secured its first court victory in the case against the University of Central Florida in a fight for public records. UCF claimed to be missing audio of a key Board of Trustees vote on Colbourn Hall, the building at the center of an ongoing controversy of misused funds. 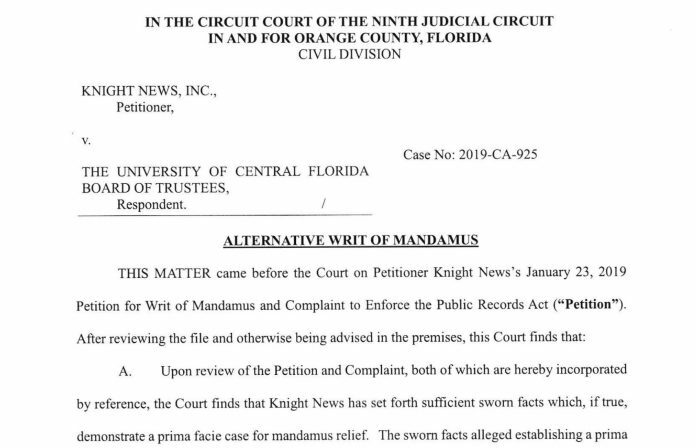 Knight News just secured its 1st major court victory in its lawsuit to force @UCFChairman & the rest of UCF’s Trustees to release audio of a critical committee vote in the #ColbournHallControversy. When Knight News made a ‘lawful request’ for any public record on September 25, 2018, identifying whether someone from the general counsel’s office was present during the board of trustees meeting where Trevor Colbourn Hall funding was approved, in addition to other records, UCF responded by claiming there were no responsive documents. If UCF does not disclose the records it must show cause why it shouldn’t within 10 days.